This week we have had a visit from Mike 'Bondy' Bond. Mike is a 69 year old 6th Dan who was one of Ben and Nelly's instructors for many years. 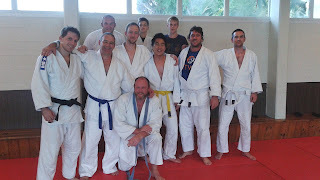 He is a great guy, good and Judo and very welcome visitor. Nice to see you Mike. After the sucess of Pia our German guest instructor we thought we might see if we can find some more Judo tourists interested in working with us here in New Zealand. 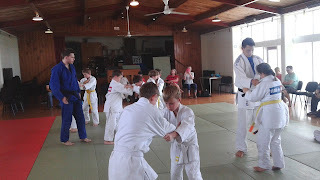 We can't offer much we aren't a huge club and your competitive Judo won't get better but we can offer great coaching opportunities with kids and adults in a supportive and friendly environment. We also have an active social calender and being part of the Big Judo team will provide you with a great range of contacts in New Zealand. Are keen to visit New Zealand.